Not much going on in Kristine Smith land. I did post over at the BookView Café blog about the doggy DNA testing I had performed in order to find out Gaby’s mix. Suffice to say, I was surprised at the results. It’s Alex Gordon work for the next week as I deal with JERICHO copyedits. Holiday prep will take place as well. So far, the weather has made it feel most unChristmassy. It’s around 30F now and blustery, but it’s possible that it may warm to the 50s and maybe even the 60s next week. No white Christmas. I took a break from copyedits to bake cookies yesterday. 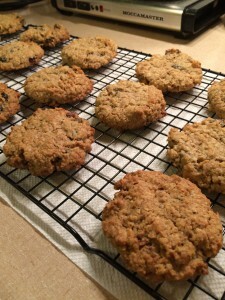 Ina Garten’s Oatmeal-Raisin-Pecan, with added chai spice and toasted coconut. Whole wheat flour and wheat germ instead of white all-purpose. Have one–they’re great with coffee or tea. Oatmeal raisin pecan toasted coconut whole wheat chai. Good cookies.